BERNARD QUARITCH LIMITED is about to publish a new catalogue dedicated to 250 years of Women Travellers, from Lady Mary Wortley Montagu’s only surviving letter written from Turkey (1717) to one of 400 copies of Margaret Mee’s magnificent Flowers of the Brazilian Forest (1968), which identifies three flowers previously unknown to science. Presentation and association copies of well-known titles by Lady Isabel Burton, Queen Victoria, and Freya Stark, represent the intervening years, together with similarly remarkable books, photograph albums, and manuscripts by lesser known figures. The authors whose writings are collected in this catalogue are very diverse: they range from dwellers in the tropics to polar explorers; from travellers on foot and horseback to those soaring through the skies and speeding along roads; and from linguists assimilating their host cultures and religions to ‘accidental adventurers’ - those women widowed, unmarried, or otherwise marginalised, who carved lives and careers out of travel writings. Many of these women contributed significantly to botanical and scientific exploration, and their achievements were recognised by honours such as the first honorary LLD awarded to a woman by Smith College (Amelia Edwards), the Royal Geographical Society's Founder’s Medal (Freya Stark), and the National Geographic Society’s Hubbard Gold Medal (Anne Lindbergh). Some found themselves at the nexus of historical political events, which they documented in their journalism (for example, Clare Sheridan and Freya Stark); while yet others followed their calling as missionaries or nurses, and brought essential health care to India, Africa, and Siberia. Whether exploring, visiting, or residing in places only known to many of their contemporaries (of both sexes) through literature or iconography, these women have inspired admiration and envy, dismissal and discussion, but rarely indifference in those who followed their travels on maps and through their writings. As Isabella Bird famously said: ‘Travellers are privileged to do the most improper things’ — and to show their readers the world through new eyes. 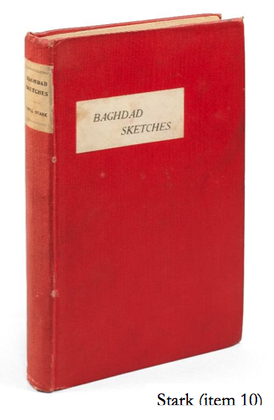 FOUNDED IN LONDON IN 1847, Bernard Quaritch Ltd is one of the world’s leading antiquarian booksellers. Bernard Quaritch (1819-1899) counted Prince Louis Lucien Bonaparte, the Prime Ministers William Ewart Gladstone and Benjamin Disraeli, and William Morris amongst his clients, and was characterised by The Times’ obituarist as, ‘the greatest bookseller who ever lived. His ideals were so high, his eye so keen, his transactions were so colossal, his courage so dauntless, that he stands out among men who have dealt in old literature as a Napoleon or a Wellington stands out among generals’.